Columbia University Press, 9780231160636, 200pp. 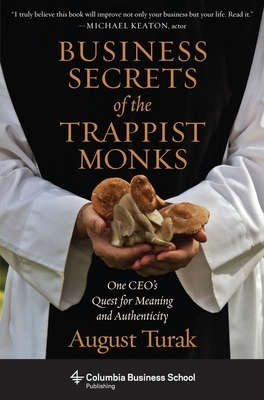 August Turak is a successful entrepreneur, corporate executive, and award-winning author who attributes much of his success to living and working alongside the Trappist monks of Mepkin Abbey for seventeen years. As a frequent monastic guest, he learned firsthand from the monks as they grew an incredibly successful portfolio of businesses. Service and selflessness are at the heart of the 1,500-year-old monastic tradition's remarkable business success. It is an ancient though immensely relevant economic model that preserves what is positive and productive about capitalism while transcending its ethical limitations and internal contradictions. Combining vivid case studies from his thirty-year business career with intimate portraits of the monks at work, Turak shows how Trappist principles can be successfully applied to a variety of secular business settings and to our personal lives as well. He demonstrates that monks and people like Warren Buffett are wildly successful not despite their high principles but because of them. Turak also introduces other "transformational organizations" that share the crucial monastic business strategies so critical for success. After a corporate career with companies like MTV, August Turak founded two highly successful software businesses, Raleigh Group International (RGI) and Elsinore Technologies. He received a B.A. in history from the University of Pittsburgh and is pursuing a Masters in theology at St. John's University, Minnesota. Turak's essay "Brother John" received the grand prize in the John Templeton Foundation's Power of Purpose essay contest. He has been featured in the Wall Street Journal, Fast Company, Selling Magazine, the New York Times, and Business Week, and is a popular leadership contributor at Forbes.com. His website is www.augustturak.com.